1976 was a sensational year for Roots Reggae. Pure gems came out in that year. I would say that almost every serious and committed Roots artist released an important album in that year, or at least a track or two that belongs to History. This can be said of the former Wailers member too. If from that side there is "Rastaman Vibration" and "Exodus" on this one we have Neville "Bunny" Livingston' debut with "Blackheart Man": a perfect set. Bunny is here at the helm producing, performing, arrangeing and directing this session recorded at Herman Chin Loy's The Aquarius Recording Studios, Kingston, Jamaica. Karl Pitterson operated, engineered and edited the tapes. The set was mixed by him and Chris Blackwell with Guy Bidmead. I heared that Blackwell was at the mixing board too with the intention to get the attention of the international market. But this information is not sure. So I only speak in a speculative way. If this supposition is not correct it doesn't matter at all. Even because I do not think that this album is an attempt to look for international-mainstreem recognition. Not at all. Bunny was not that kind of man. And again: the vibes prove that there is no compromising attitude here. The whole set is very self confident: Bunny's vocals are delivered without esitation, the lyrichs are deep and the music is calm but strong. Talking about the backing band, some of the The Wailers came to help. The support comes from: Bob, Peter, Aston "Family Man" Barrett, Carlton Barrett and Tyrone Downie. This only to prove that, in some way, the core never died and was ready to shine in any moment. Bunny plays the bongos and the congas. Other friends were there. To remember a few: Robbie Shakespeare (bass), Tommy McCook (horns, flaute), Richard "Dirty Harry" Hall (horns), Earl "Chinna" Smith (guitar). Neville Garrick is on percussion (this is the first and only time that he played in a recording studio!) in the beautiful blues of "This Train". He is responsible for the cover art too, as expected. The strongest track is the deep Roots of "Armagideon". Do not miss this gem. 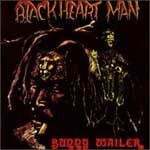 Bunny Wailer plays the Wailers, as the title says. When I saw the front side of this album I felt skeptical because I thought that I would have found covered the most known songs from the Wailers. Fortunately I was wrong. Here Mr. Livingston picks up the not so "classics" and delivers a clear heart felted performance on every song. It is a pity that some tracks are faded out at the end. He plays four tracks written by Bob, three by himself, two by Peter plus Curtis Mayfield's "Keep On Moving". The album was recorded at Harry J's Studio. Among the musician there were Sly Dumbar, Chinna Smith and Dean Fraser. I think that more than a tribute this is a statement to make the listener aware that the Wailers sound was the result of three highly creative men's energies, and not only of Bob's efforts.